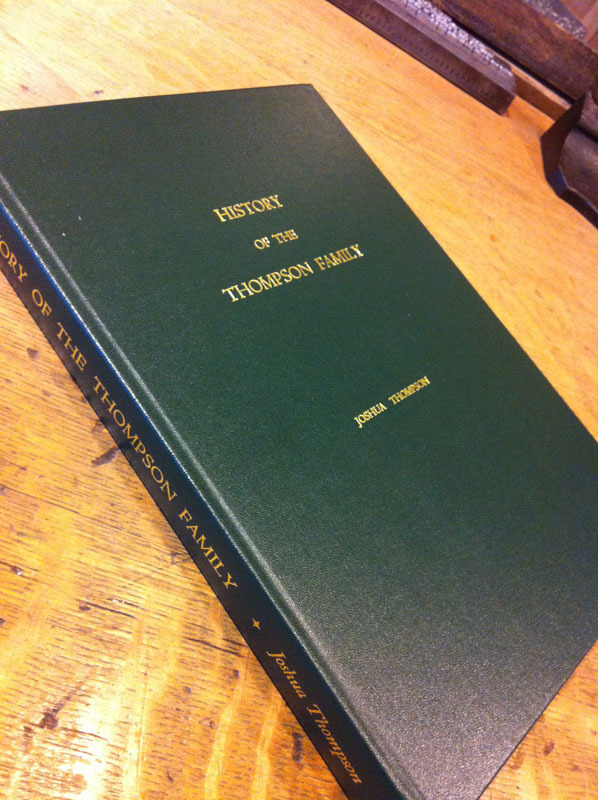 Hard bound 21st century printed edition of the Family History. For the 21st century edition of Joshua’s Family History, we decided to do a limited run off a high speed laser printer, and primarily in black and white, given the extreme cost of full colour digital printing. 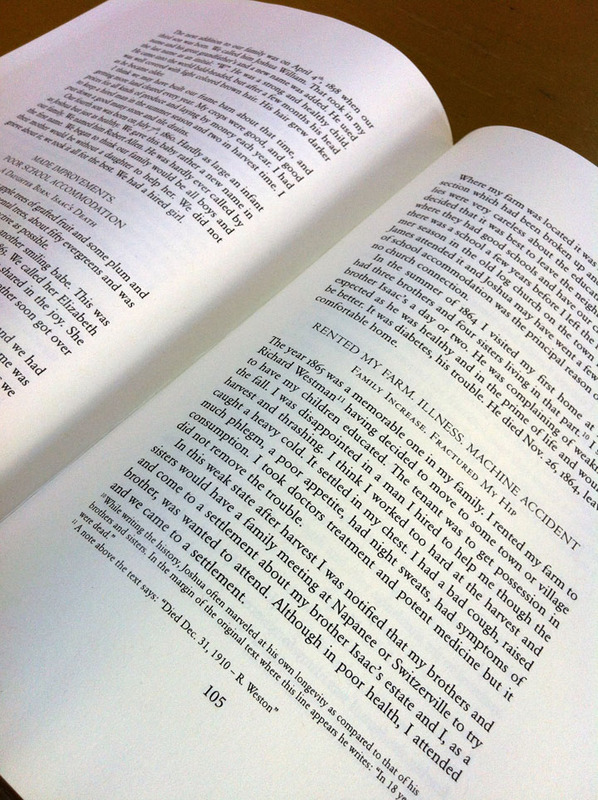 The text was spooled into Adobe InDesign, composed in Garamond BE with titles in Centaur. I chose Garamond BE because it was quite readable, and came complete with old style figures and small capitals and titling figures. Designing a book is like building a house:you start at the foundation and work your way up to the roof. Likewise in a book, you begin with the style of the type, amending typographic issues, factoring in footnotes and superscript figures etc. In many cases special fonts, italics and old style figures can be fixed using mass Find/Replace. Before any work begins, style sheets are created so that if a style change is made in one part of the book, it will automatically change in all the other parts, saving a massive amount of work. Photos and illustrations were scanned at a high resolution, then edited in Photoshop for clarity, sharpness and to correct lightness and darkness issues that happen in the scanning process. The end goal is to have a book that possesses the qualities one expects from a professionally designed book, and I’m satisfied with the result, although, as always, I would do some things differently had I the chance. The printed edition is $45 plus gst & shipping. It was printed at Impression Printing in Smiths Falls, Ontario. Bound at Smiths Falls Bookbinding. Page spread: body text in 12 pt Garamond BE, titles in Centaur with appropriate leading and generous margins. This entry was posted on October 15, 2013 at 1:44 pm and is filed under Book Design, Book Making, Bookbinding, Books, Commercial Work, Genealogy, Typography. You can subscribe via RSS 2.0 feed to this post's comments.